I think I’ve pretty much perfected making Chinese brown sauce at home. The best part about the brown sauce tonight was that I first used it as a marinade for the tofu, which is probably the best in the entire world – Wildwood’s High Protein Super Firm. It comes vacuum-packed, so there is FAR less water in it, therefore it’s incredibly firm and has a density similar to grilled chicken (without all the stringiness, of course). This super firm tofu would be awesome on the grill because it won’t fall apart! The brown sauce is savory and slightly sweet, with effervescent ginger root being the dominant flavor in this Asian-style dish. Make: Chop ginger and garlic. Mix soy sauce, vegetable broth, garlic, ginger and agave nectar together in a medium/large bowl. 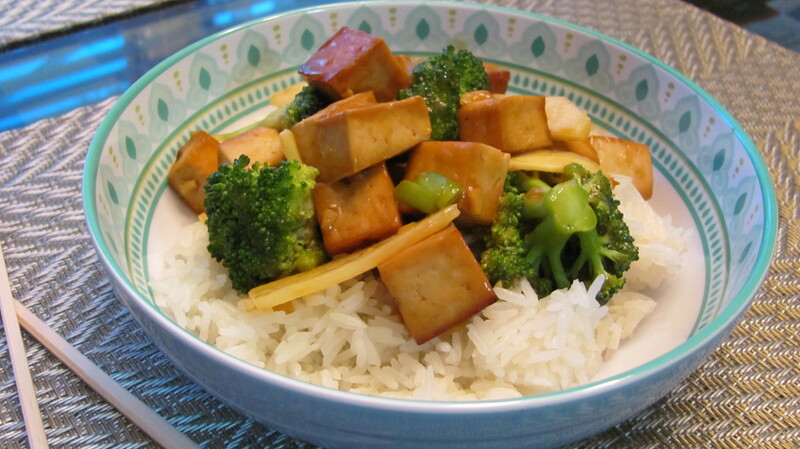 Chop tofu into 1/2 inch cubes and place in soy sauce mixture to marinate in the refrigerator for at least one hour. I let it it marinate for about 4. The longer it marinates the better it tastes! Preheat oven to 370°. Remove tofu cubes from marinade and place on a cookie sheet sprayed generously with nonstick spray. Bake on the center rack for 25 minutes. While tofu is baking, chop broccoli into florets and set aside. Pour leftover marinade into a small pot and add cornstarch when it’s still cold. Cornstarch will not combine with liquid unless the liquid is cold. Heat on medium high, or until it starts to simmer. Simmer until desired consistency is reached, about 10 minutes. While sauce heating, start working on stir frying the broccoli and bamboo shoots. Heat oil in medium skillet. Add broccoli, green onion and bamboo shoots. Stir fry on medium high until broccoli is just done. Careful to not overcook broccoli. Once tofu is baked, desired sauce consistency is reached and veggies are done, place all in a large mixing bowl and cover with sauce. Mix to coat evenly. Serve with steamed white or brown rice. Makes about 5 servings.